When listening to some of the names of the plants, fruits and animals that are part of the gastronomic culture of Tabasco, such as the chipilín leaf, the chaya, the achiote, the muste, parsley, epazote, cilantro, chile amashito , plantain leaf or tó) and the momo; animals such as tussa, the armadillo and the pigeon-petrel; fruits such as caimito and anona, etc., confirm the idea that Tabasco’s food is tied to a past of splendor and to the landscape of a territory privileged by nature. In a pot cook the shrimp, clams, peas, green beans, garlic, onion and salt. Cook the fish separately and throw the broth of it, crumble the head, remove the spines and add to the soup. Add the potatoes peeled and cut into four, the whole tomato, a sprig of parsley or cilantro and a little pepper. Let boil fifteen minutes and serve with lemon and chili pepper. Now you’re ready for eating a delicious seafood soup that will extend your life with many years for sure. Seafood is healthy and with the Mexican touch its just irresistible! With Distrita’s Mexican Food interested writers, we bring you only the best Recipes that will change your life for the better. 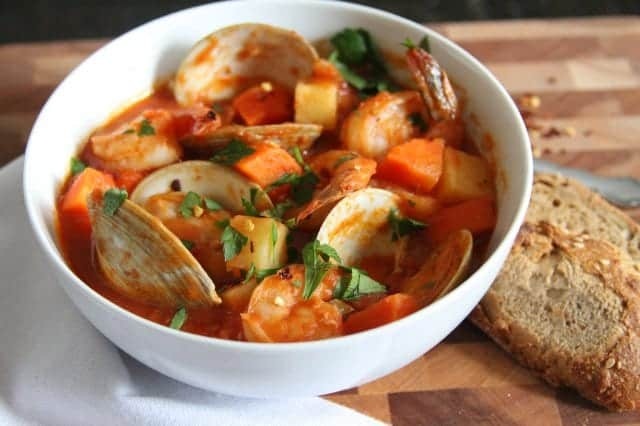 Delicious seafood soups is rich on proteins and important vitamins. It blends worlds best tastes together. Eating fishfood at least twice a week will increase your health a lot and this soup is easy to make also. We at Distrita Food Camp recommends this recipe to every seafood lover out there. Carramba!